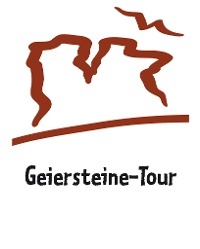 The Geiersteine-Tour is a short but varied premium tour, which is characterized by its diversity and variety. 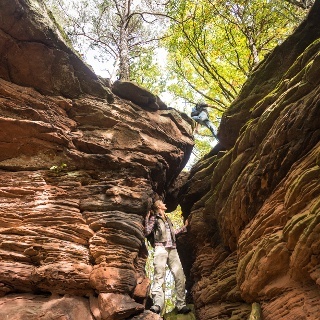 Narrow paths and soft forest trails will take you past mighty sandstone rock formations like the (1,5 km) Hornstein. But also smaller, bizarre rock formations in bright red colours line the route. So one can enjoy the enchanting and charming views of either the "Geiersteinen” (2.5km) the “Runden Hut” (3.2 km) or the "Hornstein". 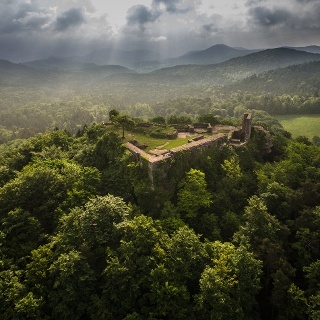 Views of the imperial castle of Trifels at Annweiler or right into the wine region of the Südliche Weinstrasse or the small villages of the Palatinate Forest such as Lug with its imposing Friedrichfelsen, which is also called "Luger Friz" in the local dialect. Incidentally: the silhouette of the “Geiersteine” towards Wernersberg resembles, with a little bit of imagination, the shape of a dragon. Refreshments: backpackers food available at the Open Air Café, in the town centre of Lug, opening times: Mon.-Fri 06.00 - 12.00 hrs. and 15:00 -18.00 hrs., Saturdays 06.00-12.00 hrs. or the Cafe Restaurant Red Rose, Schulstraße 8, opening times: Wed - Sun. from 18.00 hrs. Also In the neighboring communities of Darstein, Hauenstein, Schwanheim, Wilgartswiesen and Wernersberg. What could be better after work than to quickly scramble up to the top of a rock formation, enjoy the evening sun and just relax? 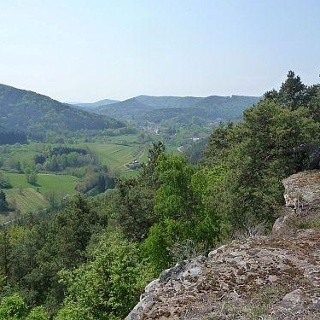 You need just over an hour from the village centre in Lug to the Geiersteinen which then allows an unforgettable view of the vastness of the Palatinate Forest. 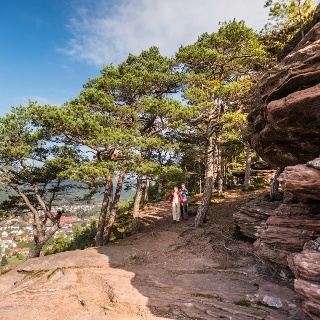 Although the Geiersteine Tour is, with its 5.4 kilometres, the shortest premium hike of the municipality of Hauenstein, shortly after the climb it is clear what it has to offer : views and distant views that you will not forget. First of all it goes quite fast up the hillside, steep indeed, but for hikers of all ages this can be coped with ease. After not even half an hour the first viewpoint is reached, the rock formation of the Hornstein - recognizable by a white cross on the summit. A narrow path then winds its way up to the ridge, from where one has a great view over Lug and the surrounding hillsides. A few metres away there is a cosy sitting area which invites you to have a small breather. From here you walk along the plateau of the western Heischberg towards the Geiersteine. As with all hillside trails, the vegetation here also has its own charm: fragrant pine trees, rustling leaves and treetops flooded in sunlight. 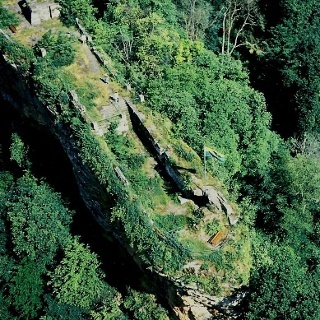 The mighty rock monument "Luger Geierstein" that protrudes like a 45-meter high ramp out of the hillside, offers a unique panoramic view. Just because of this view, it is sometimes even worthwhile taking the Geiersteine Tour after a busy day in the office, especially since the climb is done fairly quickly. Sitting comfortably on a rock plate, you can here forget the daily grind behind you and fill up with new energy. On a clear day, you can look down to the Südliche Weinstrasse. Easily visible to the east is the imperial castle of Trifels and then towards the south the hills of the Vogesen. 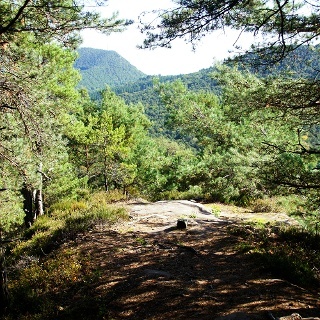 After a pleasant break on the rocky plateau, the path then leads in the shade of deciduous trees back to an altitude of 400 metres, past bizarre rock formations towards the “Runder Hut”. There, too, are seating facilities with a great view of the Trifels and the Wernersberg, down in the valley. To be able to look at the “Runder Hut” closer, one must scramble a few feet down. A wooden bench offers the last opportunity to have a rest at the foot of the rock before it goes back down to the village centre of Lug, the start of our hike. In order to experience the views, you will have to climb a bit. For this reason, the Geiersteine Tour is not completely hazard-free. Therefore, hikers afraid of heights or accompanied by children should not scramble up all the way up to the summit. Even from a respectful distance you can admire the impressive mountain scenery. Take the train to Wilgartswiesen, then call a taxi to Lug. B 10 (Landau/Pirmasens), exit Wilgartswiesen, then via Spirkelbach towards Lug. Parking area town hall Lug. Sehr schöne schnelle Tour, etwas steiler als erwartet, aber trotzdem gut mit fünf Kindern (1 bis 4 Jahre) und einer Schwangeren im 7. Monat zu gehen. Wir haben nur etwas länger gebraucht, als angegeben. Allerdings geht es an vielen Wegen sehr steil und tief Berg ab, also nichts für wilde Kinder und schwache Nerven. Unsere waren diesmal sehr brav, daher hat auch Mama die Tour sehr gut gefallen. Schöne Aussichten und wirklich angenehm zu gehen. 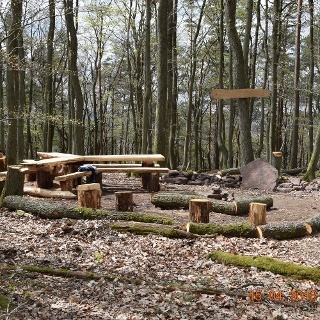 Wer danach in den unten empfohlenen "zum alten Nussbaum" will, sollte am Wochenende unbedingt einen Tisch reservieren. Die Kneipe "zur Krone" zwei Ortschaften weiter in Darstein ist nicht zu empfehlen. Schöne abwechslungsreiche Tour mit herrlichen Felsen und Ausblicken. Schöne, kurze, nicht wirklich anstrengende Tour mit trotzdem tollen Ausblicken. Es stimmt, man hört die Straße- aber das ist egal.